^ John Lewis Gaddis (1999). Cold War Statesmen Confront the Bomb: Nuclear Diplomacy Since 1945. Oxford University Press. p. 65. https://books.google.com/books?id=79RJheQYvq8C&pg=PA65. ^ United States Department of State (1951) (英語). Foreign relations of the United States, 1951. Asia and the Pacific (in two parts). Volume VI, Part 1. pp. p. 1206. http://digicoll.library.wisc.edu/cgi-bin/FRUS/FRUS-idx?type=goto&id=FRUS.FRUS1951v06p1&page=1206. ^ Immerman, Richard H. (1999). 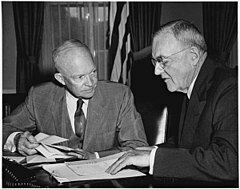 John Foster Dulles: Piety, Pragmatism, and Power in U.S. Foreign Policy. Wilmington, Delaware: Scholarly Resources. p. 98. https://books.google.com/books?id=lmhQkeaQMQEC&pg=PA98&. ^ Stephen E. Ambrose (2010). Rise to Globalism: American Foreign Policy Since 1938, Ninth Revised Edition. Penguin. p. 109. https://books.google.com/books?id=5lzMtwXckcEC&pg=PT109. ^ Ian Shapiro (2009). Containment: Rebuilding a Strategy against Global Terror. Princeton University Press. pp. 145–. https://books.google.com/books?id=i7L6if3mwzsC&pg=PA145. ^ Smith, Charles D. (2007). Palestine and the Arab–Israeli Conflict (Sixth ed.). Boston/New York: Bedford/St. Martin's. p. 247 ISBN 0-312-43736-6. ^ Cole Christian Kingseed (1995). Eisenhower and the Suez Crisis of 1956. LSU Press. p. 117. https://books.google.com/books?id=AqsJLxe2VHEC&pg=PA117.